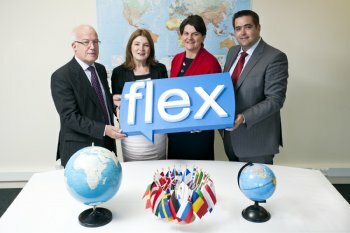 University of Ulster spin out company, Flex Language Services has been sold to Belfast based business development agency, Ortus. The move, the first of its kind in Northern Ireland, sees the acquisition of a University spin out company by one of Northern Ireland’s leading social enterprises. Flex Language Services was formed over 20 years ago as the University of Ulster’s ‘Foreign Languages for Export Service’, playing a prominent role in helping local industry, commerce, public bodies and individuals to meet the demands of an ever expanding multi-lingual market. The company caters for up to sixty languages and has 250 interpreters on its books. Key clients include the Department of Education, Ministry of Justice, Health and Social Care Procurement Department, Industrial Tribunals Court, private sector industries and individuals. Enterprise Minister Arlene Foster, who was present at the launch, said: "Ortus is an ambitious and forward thinking organisation and this acquisition is a positive example of their commitment to developing local enterprises. "In an increasingly competitive environment, it is vital we continue to support and encourage new and existing companies to boost their capability and competitiveness. "This translation service will be a vital resource to help small businesses maximise their export potential and contribute to the growth of the local economy." Enterprise Minister Arlene Foster celebrates the acquisition of Flex Language Services by Ortus – The Business Development Agency with (from left to right) Jim Collins, Chairman at Ortus, Professor Jackie McCoy from the University of Ulster and Seamus O’Prey, General Manager at Ortus.